On December 4 at Matenadaran was solemnly opened the exhibition of works of Iranian-Armenian artists - a photographer Antoin Khan Sevruguin (1851-1933) and his son, a painter Andre (Darvish) Sevrugian (1896-1997). A year ago, in 2014, the Matenadaran signed an agreement with a German citizen Emmanuel Sevrugian, according to which he donated to the Matenadaran the collections of more than a hundred of valuable works of those two worldwide artists. 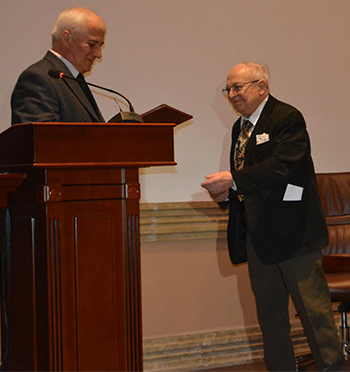 At the opening ceremony the Matenadaran’s Director rewarded the Sevrugians’ inheritor Emmanuel Sevrugian with “St. Mesrop Mashtots” Memory Medal. At the end of the ceremony took place a seminar devoted to the Sevrugians’ work activities. Before this exhibition’s solemn opening, on October 15 First Vice President of Iran Eshaq Jahangiri was acquainted with the exhibition of Sevrugians’ works.